Every year I plant my garden, anxious for my fruits and veggies. But each year I don’t plant cucumbers because each year they come back anyway. They will sprout in different places in my garden, always in a place where they can have lots of room. It just makes me laugh and excites me. It is what I call “summer magic.” This year I thought they wouldn’t come. We had an exceptionally hard winter and I started to believe my cucumbers weren’t coming and I started to panic. No pickles! What is a fermenting fanatic to do? But come they did, in a spot they had never sprouted from before. Now in my own reality I like to believe that as I sleep, fairies come at night and plant seeds, so they will grow and become cucumbers. Then I will ferment them and tell the world how to make these life-giving pickles. That just maybe, this is my destiny and higher calling. So if I find out that everybody’s cucumbers come back every year, I will be slightly disappointed – maybe even crushed. So if you don’t mind, I prefer to stay in my own crazy reality watching with joy as my cucumbers come to me year after year, and I’ll keep coming up with new recipes to fulfill my greater destiny. I think everyone should ferment, and not can, their vegetables. No big boiling pots of water heating up the kitchen. 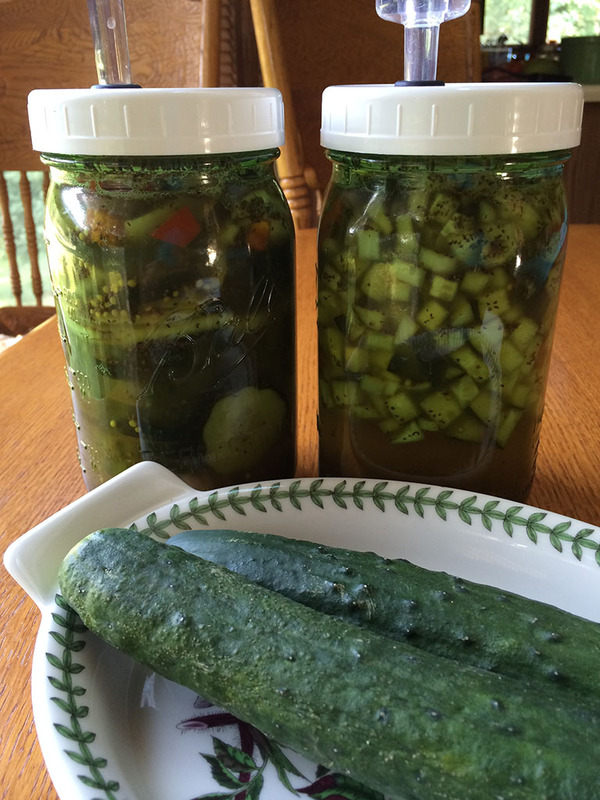 Just a little chopping and patience and you have one of my favorite foods – fermented pickles!! 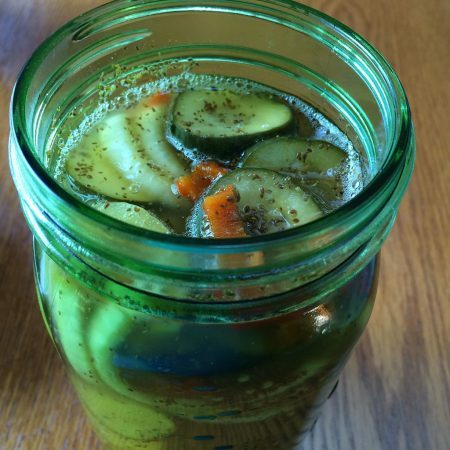 Pickles that are loaded with vitamin C and good bacteria that can change the world that lives inside of you. 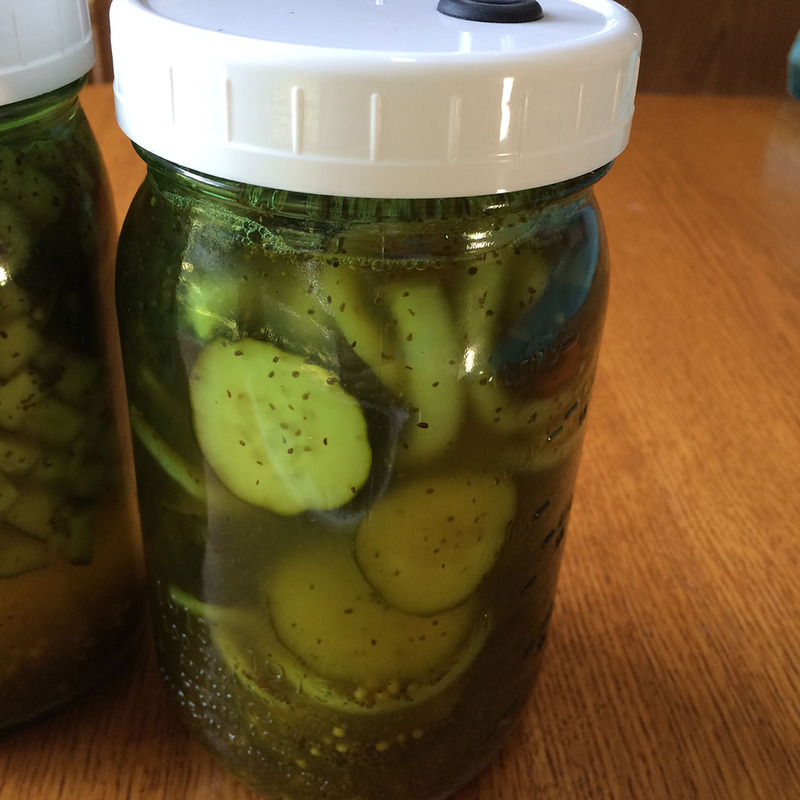 So my first recipe each year with my cucumbers is a sweet fermented relish – Sweet Pickled Relish. Man, I just love pickles! If using the starter culture, place 1⁄2 cup of water in a glass measuring cup, add the culture, and stir until dissolved. Let the mixture sit while you prepare the vegetables (anywhere between 5 and 15 minutes). If using kefir whey, add it when the recipe calls for culture in step 3. In large bowl, mix cucumbers with onion and place in one quart-sized, wide-mouthed mason jar, pressing down lightly with a pounder or meat hammer. Combine remaining ingredients (and whey, if using) and pour the liquid over cucumbers, adding more water if necessary to cover. Keep the top of the liquid one inch below the top of the jar. Cover tightly and keep at room temperature for about three days before transferring to the refrigerator. These will last at least a year in your fridge. 56 Responses to "Sweet Pickle Relish"
So, I have milk kefir whey, not water kefir. Your recipe and the comments make no mention of which type of whey to use. Thanks! Milk kefir whey is what I use to make cultured veggies. I’d like to make the homemade ketchup but fish sauce? Do you mean the red cocktail sauce for shrimp? Yes, it is a fermented fish sauce found in the Asian second of most grocery stores. I have kefir whey left over from my first try at cultured veggies and grapes. Can I use the whey to make a drink or smoothie? Hi Donna, thanks for the recipe! I was going to try this with my Greek yogurt whey, but reading the comments, I thought I would reconstitute some dried kefir grains I have. Do you have anything already written about this process? Thanks again. Do you think it would work using Kombucha instead of whey? No it tends to make the pickles very mushy. If we have dairy allergies is there any other options to substitute for kefir whey? My first attempt at cultured food! I’m liking the recipe but there is way too much celery seed in it for my tastes. How crispy are the pickles supposed to be? Mine are pretty limp. Donna can I use whey that I make from raw milk? No you can not use whey from raw milk. This does not seem to work to make cultured vegetables. There are different bacteria in raw milk that doesn’t allow to ferment properly. 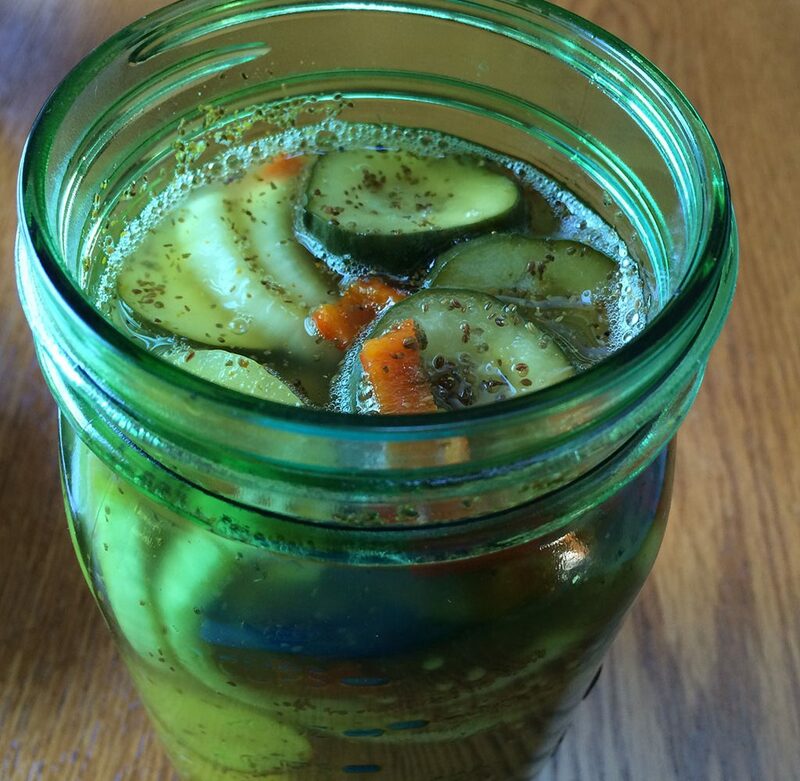 How does fermenting change the nutritional value of vegetables? What happens to the vitamins and minerals when the item is fermented? Vegetables, fruits, legumes, grains and dairy when subjected to lactic acid fermentation provides increases in both their macro- and micronutrient depending on the strains of bacteria present. Can you use komboucha instead of kefir whey? Harvested a lot of broccoli leaves yesterday. I juice and saute them but it would be nice to ferment. What to you recommend. Thanks again. You can use them in a fermented juice and could add a starter culture too it. Mmmm I will have to think about that one. Thanks for another good recipe. I am finishing up a jar of pickles I made in August from your Dill pickle recipes – they were so good. Can i used the juice from those to start another jar?. I do believe “what we give out we get back,” so I hope you and your family are enjoying a bunch of blessing. Thanks for all that you do. Yes, you can use the brine from one to make another batch. Yes, I am very blessed and so much so that sometimes it’s hard to contain the joy I feel each day. Thank you and hugs to you my friend! Donna, Can I use stevia instead of honey, making it lo carb. I have never tried this so I am not sure how it would work. Dear Donna – I’ve never, ever had cucumbers grow again on their own. In fact, they always die early from some wilt. Even this year, I tried armenian cukes instead (yes, they are melons, not the regular cuke but they taste like them and are delicious) – same issue. I got about 4 small ones then the wilt started. They blossomed but nothing else happened. I think I care too much!! But fortunately I have a growers’ market near buy. Bought a five lb bag of picklers yesterday and made a few jars of garlic dill pickles. Wish I’d seen this recipe – I’d have bought another bag. They look delicious. Can you leave the honey out or use less? Yes, you can use less but they won’t be very sweet and if you leave it out they will be dill pickles and not sweet pickles. Have you done this recipe with the airlock system? If so, did you alter it at all? And to clarify….is it a red bell pepper or some other kind of pepper? Yes, i have and you don’t have to alter it in anyway. It’s a red bell pepper in this recipe. How old can the kefir whey be and still work for culturing the veggies? It should be fresh with in a couple days of making to use for culturing. Thank you Donna for your book. It’s awesome being able to just pick it up and look for a recipe, especially the sweet pickle relish. My children (the 6 youngest), have finally enjoyed the whole of my two liter jar. They weren’t keen on even trying my cultured veges, but this weekend they had no other choices in the house. But in having the book available I don’t come online everyday. But I am most grateful for your website and book, and most of all you, for sharing. Much blessings to you and your family. Dawn. I’ve been fermenting veggies of all varieties for a very long time. 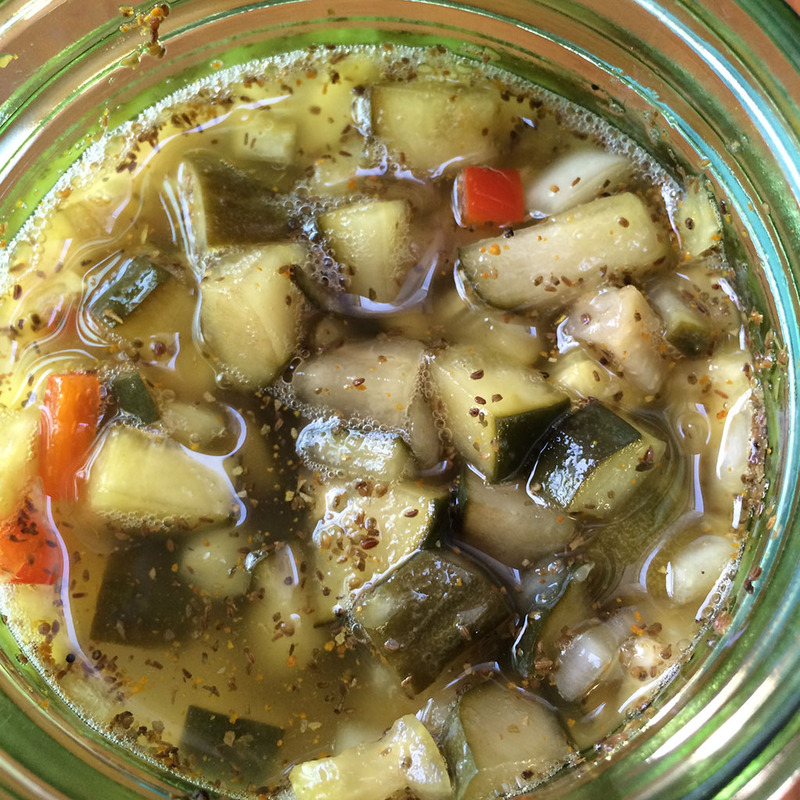 I use whey by either making lebneh or from the cheese I make….I just tasted a batch of cuke relish much like your recipe and it’s really too sour for my taste. Have you ever added Agave syrup to sweeten it at this point and what would that do to the balance for preservation? I have never used agave but have used honey and the preservation still work wonderfully. Do you think it would be okay to substitute zucchini instead of cucumbers. My mom cans a yummy sweet zucchini relish and with many large garden zucchinis, I was hoping to make relish, but I want to ferment it, not can it. What do you think? Also, does it turn mushy at all. I read that grape leaves can prevent mushy cucumbers. Thank you for sharing this recipe. You can sure try and use zucchini and yes the leaves and salt keep it crunchy. I have never used zucchini so not sure how it would turn out. I can’t wait to try this recipe,if it works as planned,we are going to try using same recipe for other veggies for my daughter to pack in her lunch. I think using baby carrots,bell peppers and green beans would be well suited for this recipe! Do you really use both Caldwell starter and whey? You need to use whey from kefir to culture veggies. It isn’t strong enough from the feta to do the job. can you leave the whey out if you dont have any on hand? is it just added to preserve it? can i add it later, when i have some? thanks! You can but it is best to add it because it cultures much more effective with it, and the good bacteria levels stay at a higher level longer. By ‘red pepper’ do you mean a chilli or a capsicum? (i’m from australia) Thanks! It is Chili. Love this question! Donna said “bell pepper” which we understand to be capsicums, not chili. Chili are hot, capsicums are sweet. I’m new to cultured foods. Can you give more information on the whey? Is it powdered? I’m having trouble finding kefir grains and I’ve not seen a cultured veggie pack anywhere. What do I ask for at the store? Can whey be used in other cultured veggie recipies? We’ve several great small grocers that are Committed to organics and ‘clean’ food products so should be able to purchase something to use – only product on the shelf in something to make yogurt…. Thanks for your great info. The whey is kefir whey which you get when you make kefir. the powder packages are culture packages which you can buy when you click on the words culture packages. You most likely will not be able to buy them locally except if you live in Kansas city because many stores carry them. Kefir Whey can be used to culture all kinds of cultured veggies. You can get all these cultures on my site under store. how long does this keep? I think there is another typo. It keeps at least a year. I have had it be fine at 1 1/2. Really tasty. Thanks, I’m making them again today and will let you know how they turn out. Is the amount for the celtic Sea Salt a typo? Should it be tablespoons or teaspoons? Mine turned out really salty. I could have measured wrong but want to check before I make them again.